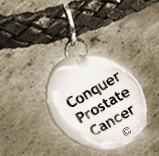 Conquer Prostate Cancer Now: Aspirin for Prostate Cancer Protection? Aspirin for Prostate Cancer Protection? Protection from prostate cancer recurrence can be found in an aspirin bottle, according to last week’s AARP Bulletin (Nov. 23, 2010). However, if you routinely take a daily low dose of aspirin (.81 mg), be aware that it could be hazardous for your health. Sure, using aspirin to thin your blood can avoid clotting, hence making a recurrence of prostate cancer less likely. But aspirin’s blood thinning effect can lead to life-threatening internal bleeding. That’s why many doctors today, unlike those in the early 90’s, don’t rush to recommend daily aspirin for most patients. Only those with a current or potential heart ailment should consider taking an aspirin. That includes people like me, since I have four risk factors for cardiac problems: I’m a man, my father (a medical doctor and dental surgeon) died of heart disease, I’ve recently become a "senior" as I'm young at heart but I'll be 67 by mid-February; and I have diabetes 2. As such I am at greater risk for heart illness than most men, so in my case aspirin is recommended. Taking a daily aspirin makes sense. But only if you and your doctor determine you are at risk for having heart problems due to a blockage or clot. As with the laws of physics, there’s an unwritten rule, even if you take over-the-counter medicines: ”For every action there is an equal and unpleasant reaction”!